oh… how beautiful are these colors. how enjoyable these markers. ahhhhhhh. i love it. my administrative assistant came into my office today while i was taking pictures of my new collection of markers…(i rescued them from the space behind j-lo’s desk, where they were underappreciated… to a place of honor, on my desk.) she asked what i was doing, and i told her i was celebrating my new markers. i love to plan things out on a big giant post-it note pad on the wall, with colorful markers. then i stick them on the wall behind the door, so we can look back at things we’ve done well and things we’ll do better… and bascially track the faithfulness of god through our massive post-it posters. 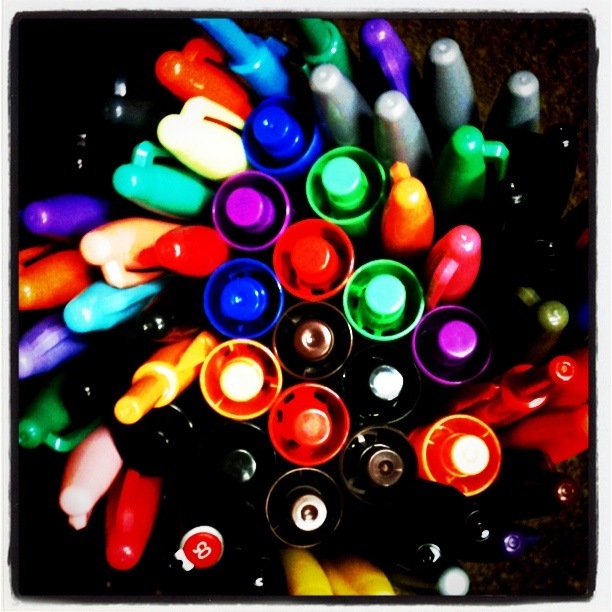 so… these markers just gave me so many more ways to capture information. plus i feel like i can tast the colors. speaking of planning, alot is up for this weekend. SATURDAY – ACTOR’s WORKSHOP – 1-3 PM; c’mon and bring a friend. and SUNDAY night CRAZY LOVE PJ PARTY… bring a friend to that too.